Bass Catches for my Clients – Dusk does it! In my previous post, I mentioned that an onshore wind, some movement in the sea and a bit of warmer weather was probably required, in addition to the sandeels arriving, to really get the bass on the feed. I knew it was only a matter of time, but it appears that the bass lure fishing season in south Devon has started in earnest. My last two clients have struck silver, and I’ve also landed a couple of beauties myself – but more on my catches in a future post… Firstly, I’ll concentrate on describing how we went about capturing the fish during this weeks guided sessions – the first of which was a real challenge of endurance. Rob’s Wife contacted me 4 months ago in relation to booking a guided bass fishing session for his Birthday. He had seen Henry Gilbey’s article in Sea Angler magazine back in January about my guiding operation and had dropped enough hints so that it became a reality! 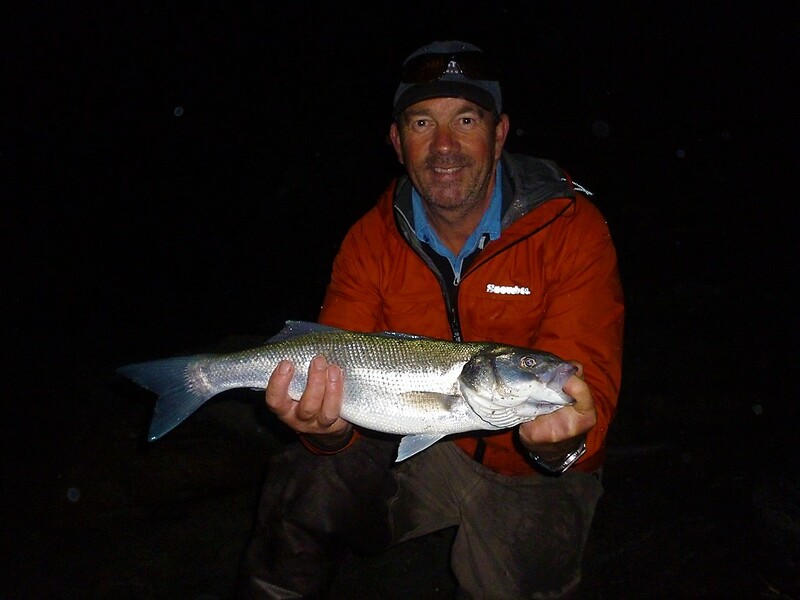 An experienced trout and fly fisherman, he had caught half-a-dozen bass on lures whilst on holiday in Cornwall over the years and was fascinated by the similarities between the behaviour of bass in comparison to trout and salmon. The weather on the day was what I’d described as bloody awful… The evening and night before had seen another pulse of heavy rain and associated strong South-West winds pushing into the region. Undeterred, I decided to head out on a recce myself for a couple of hours prior to meeting Rob – just to check out the conditions and to make sure it was safe above all else. 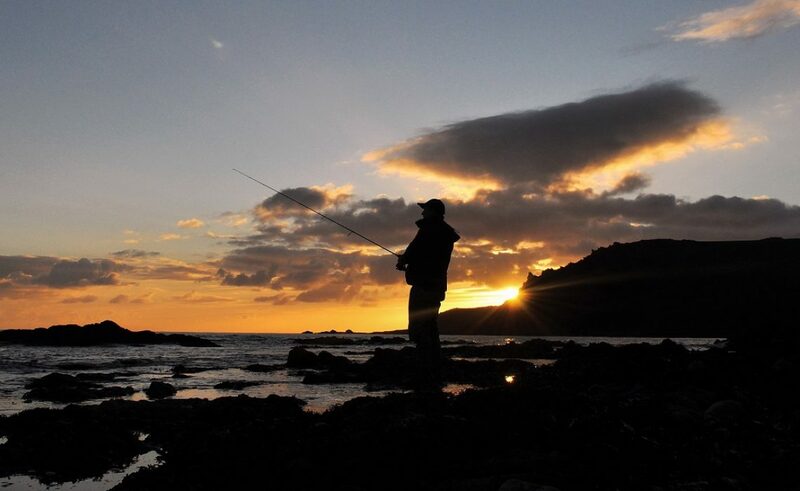 The stretch of south Devon coast I had chosen for this session is slightly deeper than the marks closest to where I live – the thought process here being that the deeper water would offer a modicum of clarity and less floating weed. When I say deeper, Rob would generally be fishing into areas around 10 – 15ft deep. Dark clouds on a day when it cleared it – it failed to do so on this particular day! The first mark is a stretch of headland whereby you can safely stand around 15ft above the swell – if you hook a bass you need to manoeuvre it into a nearby gully in order to land it; which is obviously easier said than done. This mark was recommended to me about 10 years ago now by a mate of my Brother. He’d fished it with surface lures over the low water period and had caught a number of bass in the 2 -3 lb range – the first time I ever fished it, I had a bass first cast, followed by another four before the session ended abruptly when I dropped my mobile into a rock-pool… I have fished it during all states of the tide and in many differing weather conditions since, but have found it to be most consistent 2 hours either side of low water. Essentially, you’re casting a surface lure out into the current/flow that is very evident by vertue of a ‘scum line’ (the line of foam from the breaking waves and associated flotsam) and twitching the lure within a zone close to a large (bus sized) rock that juts out into the flow. I’ve found that bass will wait at the base of this rock waiting for items to seemingly wash/drift towards them – hence the use of, primarily, surface lures as interestingly, I’ve never caught anything on any other type of lure here. I met Rob and he followed me to a nearby car park (sounds dodgy I know) whereby he showed me the gear he wanted to use – a 9ft Snowbee four-piece 10- 40g lure rod and 4000 size reel loaded with 20lb braid and a similar strength fluorocarbon leader – perfect for what I had in mind. I’d explained to Rob that he would be fishing this area for around 3 hours (up until the tide had been flooding for 2 hours) before hiking to another mark about ¾ of a mile away – but up and down a very steep hill! He expertly worked the surface lures ranging from the IMA Salt Skimmer, Duel Aile Magnet and Savage Gear Panic Prey solidly in the torrential rain, while I kept a close eye out for that slightly larger swell… I was very surprised to not even see a bass swirl at the lure in the whole 3 hours. I have to admit it was slightly disconcerting, but I was confident that the next mark (one of my bankers) would yield a bass for Rob. Aged 59, I was very impressed with Rob’s stamina – he was less out of breath than me at the top of the hill! Before long, we were perched on the next mark – an area of rocks adjacent to a beach where the bass seem to ‘patrol’ through at all stages of a flooding and ebbing (the first hour at least) tide. Casting lures out onto the areas of sand between the fingers of rock present here, I handed Rob a 12.5cm 16g Savage Gear Sandeel for a dunking as these have been deadly from this mark – You can buy them here. Further lure changes ensued every 20 – 30 minutes or so, incorporating a Storm Chugbug (large prey fish struggling on the surface), and the classic Rapala J11 and 13 (goby and pollack imitations) respectively. Paddletail lures (small mullet or brit) in the form of the ever reliable Fiiish Black Minnow (90mm on a 12g jig-head) and Illex Nitro Spart Shad (90mm on a 14g jig-head) were put into action. Plus, a new paddletail to me, the HTO Mighty Minnow (90mm on a 28g jig-head) also saw some action… These were bounced along the seabed and straight retrieved but still nothing – not a touch! Perseverance and patience… My words of the day that, by now, were probably ringing in Robs’ ears as I surveyed the area… As a client and a bloke, I could not have asked for a more receptive or nicer person to be guiding. I desperately wanted him to land a bass and it was also the first time in weeks that the conditions had been this good! I had two more aces to play, more in regards to location. On the way to the mark we were standing on, I had highlighted a small patch of shingle between beaches (that hundreds, if not thousands of holiday makers will walk across every summer) as a mark where I’ve caught bass on lures and bait over the past 25 years. Additionally, the nearby beach has thrown up some excellent catches of bass in rough conditions ,but it is very ‘hit and miss’ as to whether they’re there and feeding. Only one way to find out I thought as I made the decision to move just as it started to get dark. With 2 – 3ft of water covering a mixture of sand and flat rocks in front of him rising to 8 – 9ft in the periods of swell! Onto Rob’s lure clip went a treasured Daiwa Shoreline Shiner Z120F Vertice 19g in the Ayu (Sandeel) colour. These things cast really well and are exceptionally consistent bass catchers. Diving and swimming between 30 – 100 cm, the lure would be able to ‘dig into’ the swell – right in the ‘gutter’ so to speak (where the slope of the shingle beach meets the flatter sand) and where the waves were breaking…. Holding the rod up at an angle of 30 degrees or so and following ten or so casts, just as it was officially dark I witnessed Rob’s rod slam over no more than a rod length out from dry land! He was into fish that was surely a bass! It was! But it wasn’t over yet, as the sporadic swell threatened to drag the fish back into the undertow on two occasions and I was worried the hooks were going to pull out at any second… Grabbing the line following the next wave, I hand-lined the bass up the beach before handing it to my smiling client – a firm and appreciative handshake greeting me as 3½lb of bass was safely unhooked and held up for some trophy shots – He’d done it! I know I always say it! But the buzz I get watching a client catch and release a bass is totally amazing! I can’t describe it any other way. The hard work, effort and sheer determination that went into catching that beautiful bass – the grins on our faces and watching it dart away into the darkness is an experience that I know Rob cannot wait to realise again! Armed with his new found knowledge and confidence, I’m sure he will get to have his picture taken with many more lure caught bass in the future.